The ancient world is full of many personalities who changed the course of history. The names of these people live on today, thousands of years after they have died in many cases, because they impacted so many aspects of life in the ancient world. Among some of the best known are warriors, such as Miltiades the hero of the Battle of Marathon and Xenophon, who was a veteran of the Peloponnesian War and possibly the world’s first military historian. Kings and statesmen like Pericles of Athens, Ramesses II of Egypt, and Hammurabi of Babylon are also fairly well-known, at least their names are, in the modern world. 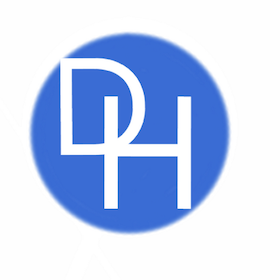 Of course, one cannot forget some of the world’s greatest thinkers: Socrates, Plato, Archimedes, and Ptolemy were all philosophers and scientists who are rightfully remembered for challenging the status quo and introducing mankind to rational thinking. But long before Ptolemy discovered longitude and latitude and even before Archimedes devised his incredible inventions, there was an engineer, doctor, and thinker named Imhotep who lived in Egypt during the middle of the third millennium BC. Imhotep, whose name is translated into English as “the one who comes in peace,” was perhaps the greatest of all scientists and thinkers in the ancient world for a number of reasons. The ancient Egyptian engineer was probably the first thinker to be identified by name, which in itself is pretty incredible, but his accomplishments surely warrant his exulted status. Imhotep was the primary architect and engineer of Egyptian King Djoser’s (ruled ca. 2667-2648 BC) tomb known as the “step pyramid.” Since the step pyramid was the first pyramid built in Egypt, Imhotep is generally considered the inventor or “father” of the pyramids. Besides his work as an engineer, ancient sources depicted Imhotep as a physician and medical researcher who was venerated as much by the later Greeks and Romans as he was by the Egyptians. Eventually, as the centuries passed and Egypt became an ancient society while it was still alive, the reverence for Imhotep evolved into full-fledged worship as Egyptians, Greeks, and Romans all made pilgrimages to a sanctuary associated with him near the step pyramid. All of these factors combine to make Imhotep the ancient world’s greatest scientist. Greek accounts, many of which were written 2,000 years after Imhotep’s death, also help to provide some background into the scholar’s professional background. Although the primary sources have allowed modern scholars to piece together some of Imhotep’s professional accomplishments, little is known about the ancient scientist’s personal life other than he was a high-priest of the god Ptah in the capital city of Memphis. A later Egyptian text, which was composed after Imhotep was deified, cites his father as the god Ptah and his mother as an Egyptian woman named Khreduankh. It is also not known how Imhotep learned his skills, but it is known that sometime, presumably during his young adulthood, he became the vizier and “overseer of works” for King Djoser. During the Old Kingdom, both positions were extremely important, especially under a particularly active king such as Djoser. Among the important duties that any Old Kingdom overseer of works would provide to a king was the construction of the monarch’s tomb. Today, most people are familiar with pyramids and most also know that they served as tombs for the deceased pharaohs, but few know that the pyramid tomb was actually the culmination of a long process that began with much more inauspicious tombs known as mastabas. Mastaba is the Arabic word for “bench,” which in this case refers to the rectangular, bench-like, appearance of the mud-brick tombs that were the standard for Egyptian kings for the first two plus dynasties of unified Egypt’s existence. But Djoser was a new king who desired to set himself apart and above all his predecessors, so he turned to the greatest engineer in the land for answers. Imhotep’s answer to Djoser’s post-mortem conundrum was simple and genius at the same time. 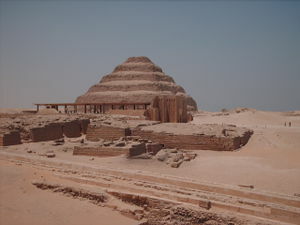 He simply placed successively smaller mastabas on top of each other until the structure was large enough for a king with an ego the size of Djoser’s. Although the change in appearance from a single rectangular block to several rectangular blocks that collectively formed a triangle was signficant, there are unfortunately no extant texts that relate why Imhotep chose the distinct shape. Most modern scholars believe that the pyramid shape was chosen for theological reasons, but there are two different schools of thought concerning the precise details. One argument is that the pyramid shape was picked because it gives the appearance of the rays of the sun shining down on the king’s resting place,  while others believe that it was meant to represent the primordial mound from which the creator-sun god Atum sprang according to the Heliopolitan cosmology. Whatever was the reason Imhotep chose for Djoser’s pyramid, he made sure that it would stand the test of time. Djoser’s pyramid dwarfed all other monuments built in Egypt before the king’s reign. Surrounding the pyramid stood a thirty-four foot high, 5,397 foot long limestone wall. Within the confines of the wall, in the shadow of the pyramid, were a number of smaller temples, pavilions, and altars. The pyramid itself was built in six stages, with all of the constituent mastabas combining to a height of 197 feet and containing 11,668,000 cubic feet of stone. Imhotep’s creation was truly magnificent as it inspired Egyptians in the Fourth Dynasty in order to improve upon his methods to ultimately create the first “true pyramids.” As impressive as Imhotep’s efforts were to build Egypt’s first pyramid, he also attained fame for his work in the fields of medicine and general scholarship. The details concerning Imhotep’s background as a writer are a little less clear. 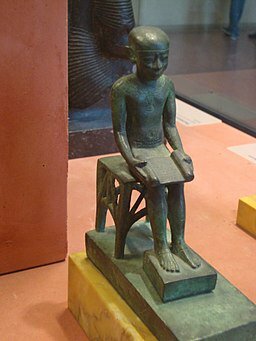 Besides the Manetho passage cited above, numerous later Egyptian and Greek sources ascribed many literary works to Imhotep and he is often depicted as a scribe in works of art from Egypt’s Late Period (ca. 664 BC-Christian Era), but unfortunately, none of his works have survived. Perhaps the greatest proof of Imhotep’s supreme scientific and scholarly abilities came during the Late Period when Egyptians, Greeks, and Romans worshipped him as a god. In ancient Egyptian religion, it was not unheard of for a mortal to achieve deified status after his or her death, but the person in question was almost always a king or queen. Imhotep was one of the few exceptions to this rule. Egyptians began worshipping Imhotep about 100 years after his death, but the scholar turned god’s religious following remained relatively minor for nearly 2,000 years. 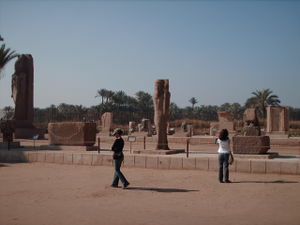 When Egypt entered the phase modern scholars know as the Late Period, Egyptians became much more engaged with their neighbors, with the result being the adoption of some foreign cultural elements by Egyptians and conversely foreigners living in Egypt began to accept and modify some elements of pharaonic culture. When the first Greeks who lived in Egypt saw Egyptians worship Imhotep, they were very impressed by the scholar and his life and so in typical Greek fashion they equated Imhotep with their own Asclepius and joined in with the worship. Imhotep’s primary “cult-center,” which is where his followers believed his spirit physically resided, was near Djoser’s pyramid in what is known today as the Saqqara necropolis. Worshippers of Imhotep gathered at Saqqara in a sanctuary dedicated to him that the Greeks called the “Asclepion.” Since Imhotep was associated with wisdom and scholarship, pilgrims would dedicate mummified ibises on his behalf in the Saqqara necropolis because the ibis was associated by ancient Egyptians with the god of wisdom and writing – Thoth. Worshippers also routinely asked the priests who looked after the sanctuary if they could sleep there in order to have dreams that would give them remedies for sick family members. Imhotep’s role in the religion of Egypt’s Late Period extended beyond the pilgrims who actively worshipped him and eventually made its way into various mythological and theological texts. The reverence that Imhotep received from generations of Egyptians, Greeks, and Romans, though, eventually came to an end when Egyptians began converting in large numbers to Christianity. Imhotep’s name became obscure and he was largely forgotten until the emergence of the discipline of Egyptology in the nineteenth century. Long before Newton, Copernicus, or even Archimedes pushed the limits of human knowledge, an Egyptian scholar named Imhotep introduced science to the ancient world. Imhotep’s greatness as a scholar was due to a combination of his genius and ambition, which allowed him to build the first Egyptian pyramid, practice medicine, and to write tracts that are unfortunately now lost. Those feats alone were enough to make him the greatest scientist in the ancient world, but his reputation was so great that he was eventually worshipped as a god, even by non-Egyptians. Truly, when one considers the greatest minds of the ancient world, Imhotep should be at the top of any list!